Mechanical keyboards are built to withstand a tremendous amount of workload compared to their plastic counterparts. They’re significantly more structurally sound, simpler to type on, and more. More often than not, however, these desirable qualities result in increased prices. But is it possible to find effective yet affordable mechanical keyboards? Read on to find out. First on the list is the attractive 104-key GoFreeTech Mechanical keyboard that comes with removable keycaps. It’s chiefly built to improve durability and offer tactile feedback. Its keys are characterized by precise actuation, medium resistance, as well as a pleasant audible click sound. An additional striking feature of this gaming keyboard is it’s water and sweat resistant capability, meaning people who tend to sweat during intense typing and gaming are covered. At a price of roughly $19.99, the Rii RK902 is an even more affordable alternative. It’s designed with up to five gaming lighting effects that can be customized as desired. Besides, it’s also possible to control the brightness of the board’s keys and effect speed. This keyboard comes with Kailh key switches that are at more or less the same level as other products in their category. The affordability of Kailhs can mainly be attributed to the fact that they are manufactured in China. Cherry, which are present in more pricey options hence more coveted, are made in Germany. Unlike other gaming keyboards, the Nixeus Moda doesn’t come with over-the-top features. For instance it doesn’t feature LED backlighting, and lacks gaming micro keys. But that’s not a big deal for people who aren’t really into backlit keyboards. The keyboard also provides a somewhat soft tactile feedback to the fingertips during typing. Also, it boasts of longevity, guaranteeing users long-term durability of approximately 50 million keystrokes. The Logitech G413 employs the Romer-G mechanical switches, which are designed for durability, quick response, and professional performance. The included red key lighting is both clean and precise via the keycap, significantly increasing visibility during typing. PC Mag gives the keyboard an ‘Excellent’ rating, commending the company for the board’s programmable function keys as well as sturdy construction. The demerits, however, include the lack of wrist rests —which are present in most of the mechanical keyboards included in this review—and inability to customize keyboard backlighting. The Havit HV-KB390L has got to be among the top mechanical keyboards available below the $60 price mark. It incorporates the Kailh switch beneath its relatively thin plastic keycaps. Furthermore, it’s portable and small, and features LED backlighting (light blue). It’s also easy to type on because no extra force is required. Likewise, due its compact size, typing would be faster on it because fingers don’t need to travel too far. This incredible mechanical keyboard from Aukey promises a colorful, immersive gaming and typing experience. 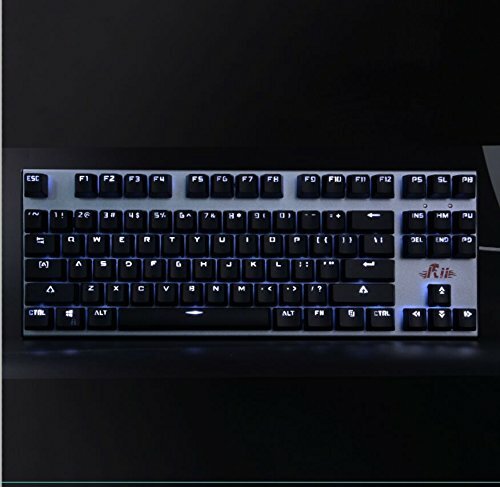 Similar to other options in this list, it also includes RGB backlighting for keys. The user has the freedom to select from up to 7 varying color options and 9 preset lighting effects for each individual key. It’s built with the Outemu tactile switches, which are basically an outrageously cheaper version of the Cherry. In addition to an audible click sound and tactile feedback, the keyboard is also waterproof, hence accidental spills don’t necessarily translate to termination of a gaming or typing session. A significant number of mechanical gaming keyboards are exceedingly expensive, and deservedly so because they feature exceptionally useful and unmatched features. But how does the avid gamer on a tight budget get to realize an almost similar level of performance and functionality? The answer lies in the budget options included above. Keyboard reviews azspecialoffers is the place to find more enlightening keyboard reviews.